Dora... one of my favorite "hippie girl" sketches from 1968. Youthful and shivering from the cold wind, she had always lived in San Francisco. "Dora" would now be approximately 55 years old! Kearney as he appeared in the late 1960's. 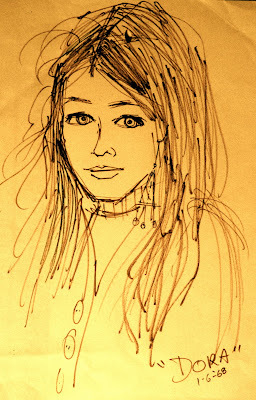 With sketch-pad in hand I journeyed to San Francisco and asked young hippie girls if I could draw their portrait. I was then going to create a story for a magazine! These letters below were the 1st draft of that idea. Here are some of the women kind enough to sit for a quick sketch! note from my sketch book:"Sean" 1-6-1968 While doing this sketch on the stairway to an apartment building we were kicked off by an irate landlord who yelled:"you kids get out of here, go play in the park, I'll call the cops!" She was from San Diego. She wants to open a dress shop in the future. Elsewhere in this blog, see Haight-Ashbury cartoons and photos. I love your sketches. Your work is awesome!